Above is a group photo of Swedish students plus staff and instructors. Taken at McQueen Lake Environmental Education Centre, near Kamloops, B.C., Canada. Doug Richardson at extreme far left beside, partner, Alison McLean. (blue and gray jackets). Alison assisted in the overall planning and operations of this event. Missing from photo is Mike Cleaver who was also a key FireSafeTraining, instructor. 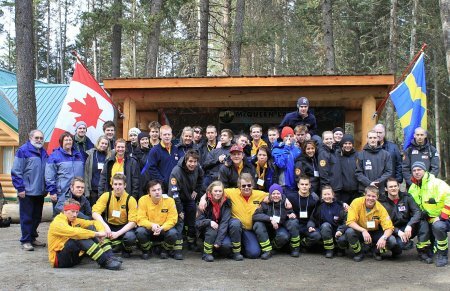 The students along with their Swedish and Canadian instructors, spend a week during early spring, learning about wildland and interface fires. Everyone had an excellent and very informative time. The students were very advanced in many levels of emergency response training and the wildland fire course just added to their training experiences. They were all a great pleasure to work with for the week. www.firesafetraining.com (DRAM Ventures Inc.) hosted and facilitated this event. Mike Cleaver and myself, Doug Richardson, were the key instructors. The Ministry of Forests, Wildfire Management Branch also supported and had representation for this event. Mark Healey and Hugh Murdock of the Kamloops Protection Zone Offices delivered excellent presentations. April 2013 will see 40 Swedish students along with instructors descend once again on McQueen Lake Environmental Education Centre - in the forests, near Kamloops, B.C. Planning for this new group began one day after the first group left Kamloops on their way to the U.S.A. for more training and adventure. This year we expect there will be more outside agencies involved giving demonstrations and lectures. There will also be a substantial First Nations' component involving side-by-side training as well as cultural events. If anyone is interested in learning more about this specific program or in developing with us, a program for your needs - please contact us.